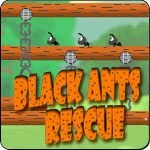 Description: Rescue the black ants from their evil counterparts, the red ants! Guide the black ants to their safe house by moving logs, houses, etc. Physics-puzzle for all ages!